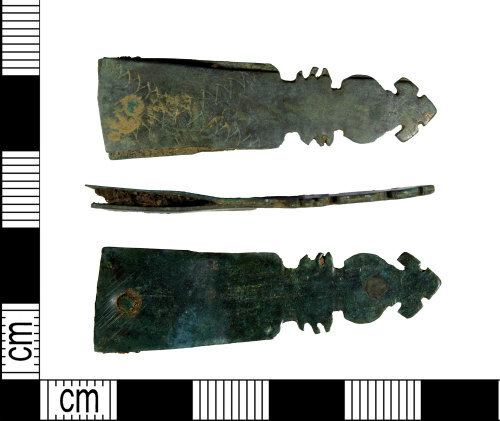 Medieval copper alloy strap end, 1350-1400. Length: 44 mm, width: 14 mm, thickness: 3 mm, weight: 3.42 g.
The object is sub rectangular in form and rectangular in cross section. It is formed of two plates rivetted together with an ornate terminal. This has an angular trefoil shaped projection sitting below a sub circular plate which has a central rivet. Next is a narrow collar abutting a rectangular plate, with three sub rectangular projections at each side. Another narrow collar separates the terminal from the main plate. This is rectangular in form and its outer, narrow edge is slightly wider and houses a centrally placed rivet. The two plates are separated slightly to accomodate the strap and are decorated on one face with two rows of incised 'rocker' work (zig zag lines) which form a saltaire motif. The object is similar to NLM-45710D but more ornate.